Sudoku Mahabharat and Puzzle Ramayan is one of the best thing which recently happened at Logic Masters India website. Earlier we used to have regular Sudoku and Puzzle test at LMI website. However these test appeared hard for the beginners. Expert solvers were enjoying these test but sometimes these tests were discouraging for newcomers. Sudoku Mahabharat and Puzzle Ramayan are aimed at beginners. These tests are designed so that average player is just able to solve these tests, while beginners enjoy participating in these tests. However I have seen some expert players wanting for more from LMI website. Moreover these monthly tests now acts as qualifier for Indian Sudoku and India Puzzle Championship 2016. 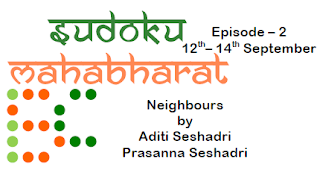 Anyway coming to this month's Sudoku test, it is Neighbours themed Sudoku test authored by new comer Aditi Seshadri and India's one of the best Sudoku player Prasanna Seshadri. This test will take place from 12th to 14th September at Logic Masters India website. Last year I authored Neighbours themed Sudoku Mahabharat test. This year there are many similar Sudoku variations appearing in this test with some additions. Last test, I was just able to complete leaving one mini puzzle. This time targeting to complete this test on time.